Sometimes we need to seperate our work spaces to create better workflow, or we need to protect personnel from potential risks. 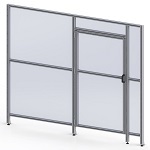 Whatever the need, our wall sections can be built fully assembled or packaged as a kit to facilitate your installation. 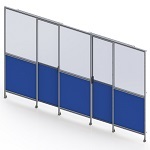 Our wall sections can be used as a machine or acoustic barrier, to enclose a work station, or as a simple divider to separate tradeshow exhibits. 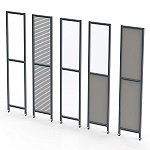 We can provide you with a wall system to fit your needs. Need something custom? No Problem! We're more than happy to help provide a unique solution that will fulfill the needs of your project.